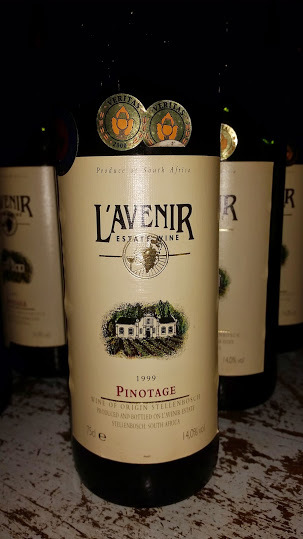 Last night a tasting of the eight vintages of Pinotage from Stellenbosch property L’Avenir to have won at the Absa Top 10 Pinotage competition: 1996, 1997, 1999, 2000, 2001, 2002, 2003 and 2011. The wines from 1996 to 2003 where made by the respected Francois Naudé and back in the day were among the most highly regarded examples of Pinotage around. Looking at them now, they’re not without interest but appear a bit rough around the edges, partly because of the inherent nature of the variety but partly also because local winemaking has come a long way since then. The other curious thing was there was a general feeling among tasters that the supposedly lesser vintages – 1999 and 2002 – showed particularly well. Did a gentler handling in the cellar of supposedly less than ideal fruit contribute to this? Entirely from a block planted in 1965. Red cherry, farmyard and forest floor plus a note of varnish. Bright acidity and nicely resolved tannins. Long and savoury. Full of personality. Incorporating some grapes from new vines as with all subsequent vintages. Red and black fruit – good concentration, fresh acidity and smooth tannins. Pleasant but a bit hollow on the mid-palate and the finish short. Red and black fruit, forest floor and boot polish. Rich and full but balanced – fresh acidity and nicely grippy tannins. Still going strong. Reductive. Red and black fruit, hard acidity and astringent tannins making for big but gawky wine. A second bottle later in the evening showed much better but disappointing given the high reputation of the vintage. Red and black fruit, spice and a slight note of varnish. Well balanced, still lively, pleasant tannic grip. Archetypal Simonsberg Pinotage. Red fruit and some musky perfume. Medium bodied with fresh acidity and a gently spicy finish. Red and black fruit, spice plus a notable earthiness. Hard acidity and astringent tannins. All rather severe. Red and black berries, vanilla and subtle note of dried herbs. Clean and correct with succulent fruit and well managed tannins. Current releases are the Single Block Pinotage 2012 (R300 a bottle) which is gigantic and just about impossible to drink and the Provenance Pinotage 2012 (R120 a bottle) which is medium bodied and, believe it or not, quite pretty – definitely the way forward as far as I’m concerned.